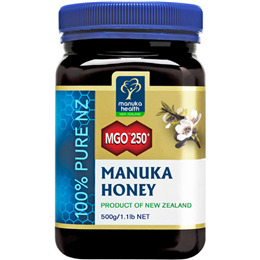 Manuka Health MGO 250+ is 100% pure Manuka Honey straight from the breathtaking landscapes of New Zealand. Honey is well know to have a wide range of health benefits and Manuka Honey is particularly prized for it`s potency and purity. Below are reviews of MGO 250+ Manuka Honey - 500g by bodykind customers. If you have tried this product we'd love to hear what you think so please leave a review.